After buying some ghost money from Mr G’s warehouse we head back to NTMoFA (National Taiwan Museum of Fine Arts) with my purchases. 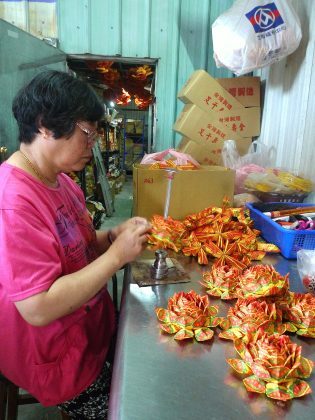 At the warehouse, a woman had been making paper lotus flowers from ghost money. These flowers can be purchased individually or in bags of fifty. 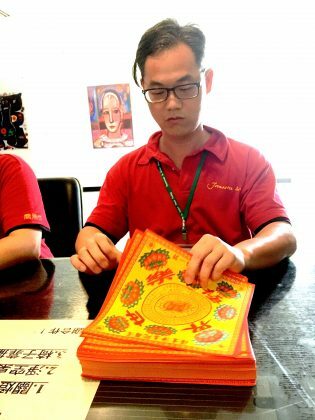 One of my guides for the day is Mr Cheng, who is very knowledgeable about the correct ritual use of ghost money – Mr. Cheng had worked at his temple and part of his work there had been to make over 100 lotus flowers a year so he was an expert at folding and assembling them. 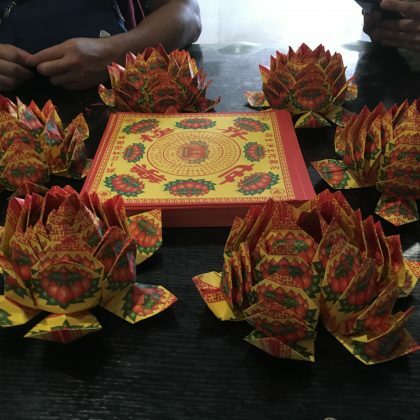 Mr Cheng advised me which paper squares to buy to fold and make lotus flowers from and promised to show me how to make them. 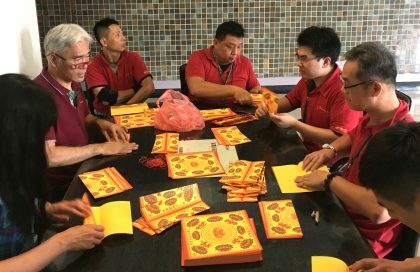 At the NTMoFA, myself and several of the technicians settle down to a couple of hours of lotus flower making. Mr. Cheng is our instructor. He carefully took me through the many stages of folding needed to make paper lotus flowers from the ghost money. 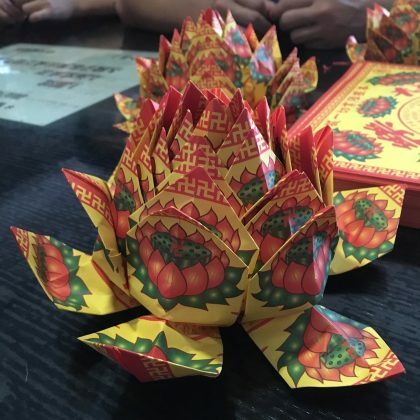 The lotus flowers are made from 18 sheets of ghost money paper, each folded several times. The folded parts connected by elastic bands and then shaped into the classic lotus form. 18 sheets are used to represent the 18 levels between heaven and hell. I learn that there must be 18 lotus flowers, or any number dividable by 18, lotus flowers in my installation. 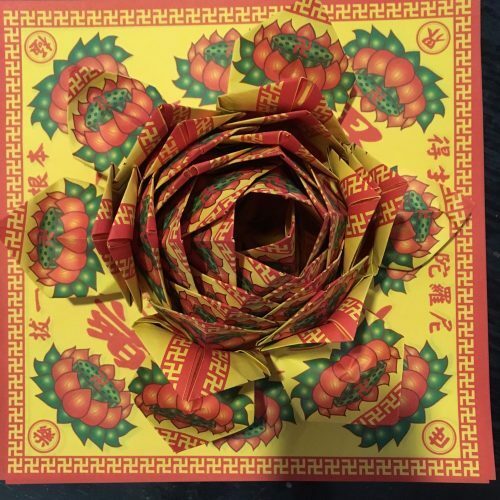 It took a long time to make one flower, but the finished paper lotus flowers look beautiful.